New in v 5 | | Watch Movie! as per Twitter’s new display requirements. 3. If it’s a Retweet, you’ll who did it - tap their name at the bottom of the tweet to see their profile. What’s New in V4.7 ? Uses new Twitter permissions and web authorization page Old accounts must be updated. Post to Facebook Wall Settings -> Services -> Facebook - you can optionally turn it on and off in the compose window too! Tweet the playing song and album art: Tap media button in Compose, choose "Playing Song Info". If it has art, it's automatically included - you can tap the media button again to rid the media. Messages are stored on your phone - so you can tap the bubble on any message and see the last conversations between you and the other person. 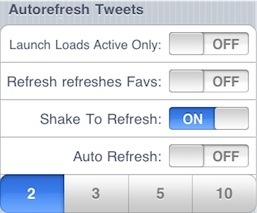 Drag down top tweet to refresh: pull down on top tweet to reveal new refresher controls. When it says 'Release to Refresh', release. You cancel by dragging back up before releasing. Drag up on last tweet to get more: in a like manner, you can get more tweets by pulling up on the bottom tweet. Update your bio: in My Profile, tap your bio info to go to a panel where you can edit your bio, location, and name that appears in tweets. Remember, tap your avatar to change the photo. Show Only Geotagged Tweets in Nearby option in settings so you get only bona fide geotagged tweets as opposed to Locations that are also near. Search -> Find People lets you find people by their real name, just like Twitter's People Search. 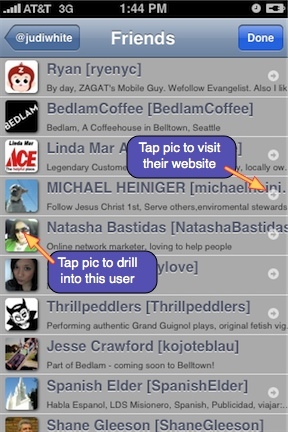 Swipe Left to bring up User details of tweeter or anyone mentioned. 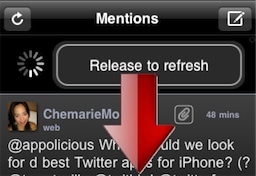 Reply All: tap avatar in a tweet with mentions and tap new action "Reply All"
Trends -> What the Trend? explains just why a trend is trending - very useful & interesting! and favstar - check 'em out! 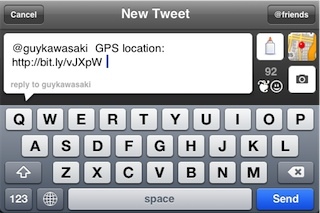 Find tweets Nearby to anywhere! Tap and hold any map to find tweets from there! Change your Avatar anytime! 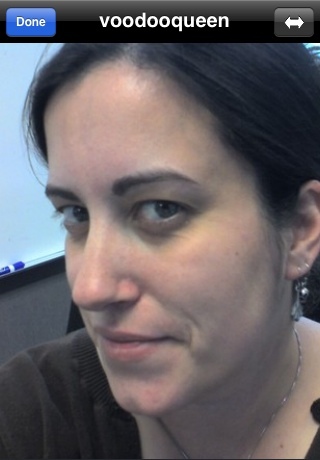 Just tap your own picture in "My Profile" to choose photo. Tap link icon to see entire TwitLonger (tl.gd) right in the tweet itself! New for 3.3: Custom Themes you make & share See Search ⟿ Find Themes to see every tweeted theme & search them too! Just tap Paperclip to install one. Search Nearby Tweets on Google Maps! 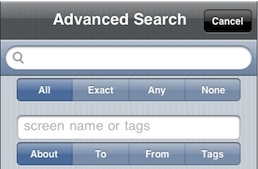 HINT: Tap on the top tool bar for new search or different location. Tap & hold does new search. 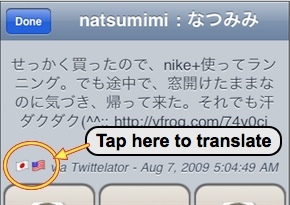 Note: you need iPhone OS version 3.0 or greater to run Twittelator Pro Version 3.1! Use iTunes to update. If you choose TwitVid as your video upload, you can also configure co-Posting of your video to YouTube - tap the YouTube button to configure - be sure to enter a valid YouTube username and password. You can turn on and off the co-posting of video with the On-Off switch! If you want to copy just part of the tweet, you can tap and hold which brings up magnifying glass, release to see the Select | Select All menu, and tap Select to grab what you want, then tap Copy. Tap Done on keyboard to return to options. Readers can tap the Read More: link to see the rest of the tweet. More power has been added to the User Detail panel, including the ability to temporarily Mute users (without unfollowing them). When muted, their tweets are omitted from your Friends timeline (but you still get @mentions and DM's from them). 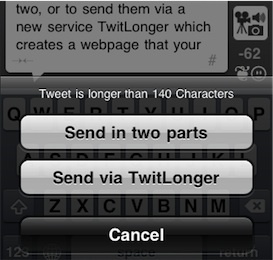 That's useful when they are tweeting too much! Note you can report a tweeter as a Spammer to twitter.com - although what they do with that info is not known! This also adds that person to your Blocked Users list. You can now zoom and pan the big Avatar and full screen images - tap the actions button to save and copy! 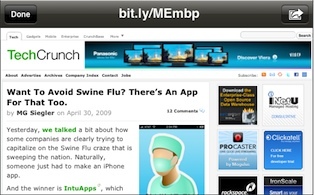 Web browsing has been greatly optimized and can play video, audio and other media right in the app. 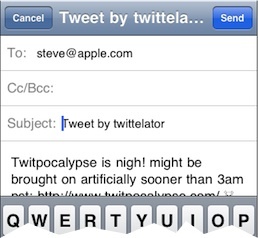 Clicking mailto: links lets you send email with Twittelator too! 240 colorful emoji along with 320 dingbats to spice up your tweets. Note: Emoji’s are only visible on iPhones/Touches and Japanese mobile devices. 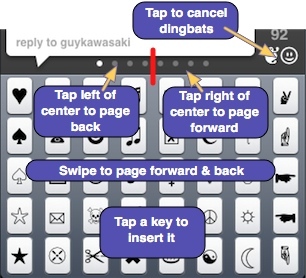 Paste Photo into tweet: if there is image on clipboard, the glue bottle button will appear - tap it to include photo. 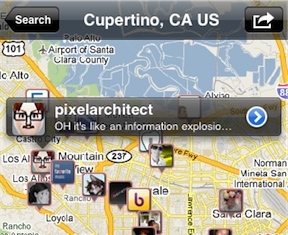 See street map, satellite map or hybrid map of any tweeter’s location - just tap on their location in User Details. Placename location setting now uses Google’s Reverse Geocoding for better results worldwide. Placenames are quite vague if you don’t want to give out your exact location. Google map URLs are shown in Maps too! 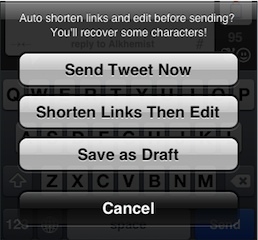 Tap name, and then Save Tweets to save one or all tweets for reading offline or archiving. 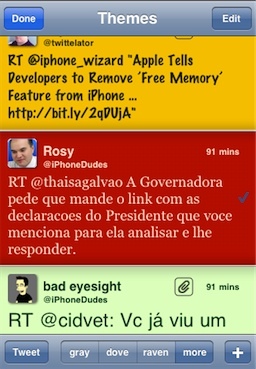 Friends tints tweets by you with rose tint, and tweets that mention you mint tint. 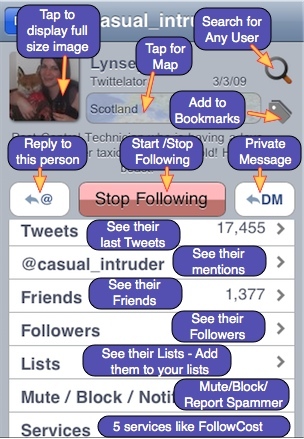 Helps you find your tweets and mentions quickly! Search results also show these! If you posted this tweet or message, you’ll see a delete button. Copy Link to Tweet - great for short retweeting! 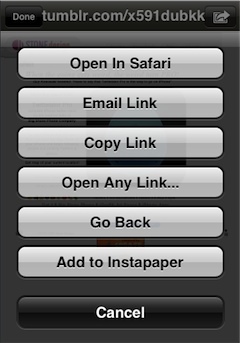 Go to Settings to configure your Instapaper/Read It Later account where you can save links you see for later reading. If a tweet has a link, you’ll see the “Copy Link” option. You can Delete DM’s or Tweets you wrote. 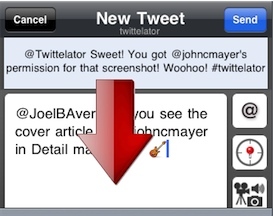 Tapping the Paperclip, Speaker or Video loads Twittelator’s built-in web browser. Learn all about a user, their friends and followers, and start following and bookmark. Note: if they are following you, you'll see the DM (Private Message) button and you can DM them! When you tap the Detail photo, their large avatar image appears (be patient on Edge!) Tap the Actions button to save or copy the image - zoom by pinch! In the returned tweets, tap their picture, and tap Start Following! Tap Mute / Block / Notify to mute/unmute and block/unblock a user and change whether you get notifications when a user DM’s you. Note: go to twitter.com settings to change whether notifications TXT or EMAIL you! 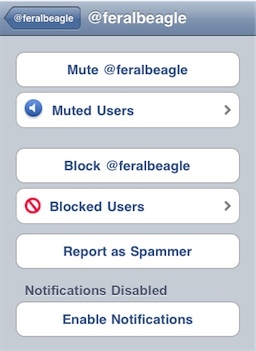 To see your entire list of muted users, tap “Muted Users” - you can then un-mute them. Muting keeps this person's tweets out of your Friends timeline and is useful if they are tweeting too much, but you don't want to unfollow them. To see your entire list of blocked users, tap “Blocked Users” - you can then unblock them. Report as Spammer notifies Twitter and also blocks the user. Note: Notifications only apply to people you are following. 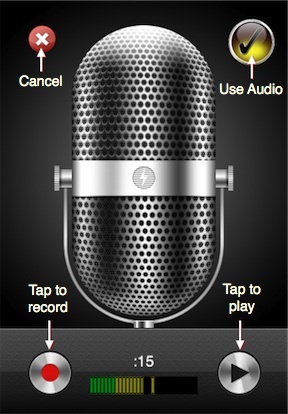 Tap record button to start recording/ stop recording or re-record. Tap Play to hear clip. 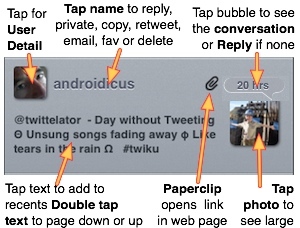 Tap Use Audio check mark to include the audio in your tweet. 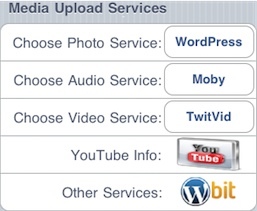 Currently, only MobyPicture supports audio uploads - this is set for you automatically. Tap a draft to enter it into the compose window. Tap Checkbox to make draft “persistent” - it won’t be autodeleted on send so you can reuse it!. Change Accounts: If you have multiple accounts, tap “Drafts” to change accounts “mid-compose”. Tap Edit to delete a draft. Drafts are automatically deleted when you use and send a draft, and updated if you save a draft after editing it some more. 1. It takes your phone about a minute to get a really good GPS location - so you may get a delay after tapping the Map button - be patient! 2. Taking snapshots is very memory intensive! 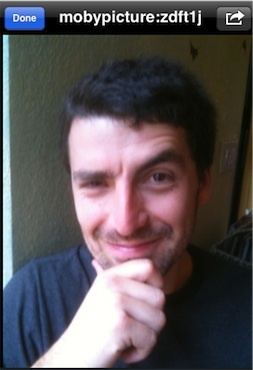 You can get best results by using Camera app to take photos and just choose them from your Library within Twittelator. 3. To copy something to paste, tap Tweeter’s Name in any tweet - and choose Copy or Copy Link if there is a link in the tweet. 4. 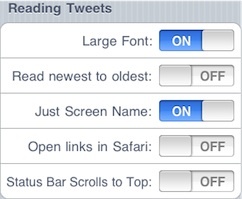 Did you know you can start a new Tweet from Safari? In Settings, you’ll see an item “Tweet From Safari” which instructs you on setting up a bookmarklet to make it very easy to send a link from Safari to Twittelator. 6. Private Photos: If you attach a photo to a Direct Message, it will be sent using Pikchur or MobyPicture - they support Private (DM) Photos. 7. Messages are queued and if they fail, will be resent later - see also “Message Queue”. Dingbats, arrows, Hebrew, zodiac and more! ←2 queued messages to send. If you have multiple accounts, the message will get sent when you change back to the account it was originally sent from. 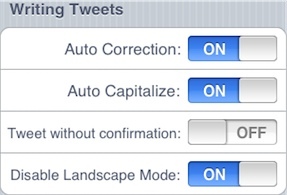 To remove 'stuck tweets' - Settings -> Image Options -> Clear Image Cache also clears tweets. 5. You can quickly switch accounts from the New Tweet window: Tap toolbar to bring up Drafts, tap Drafts toolbar to change accounts! Hint: Tap your avatar to change it! 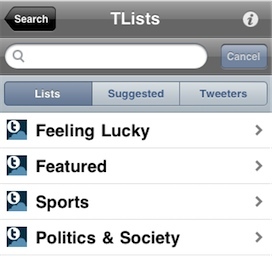 Lists let you track smaller groups of twitterers so you don't miss a tweet. 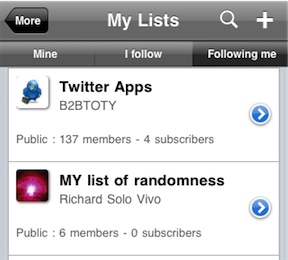 Twitter.com now supports lists so the lists you create in Twittelator are visible at twitter.com and vice versa. There are 3 types of lists: the lists you create (Mine), the lists you have subscribed to (I follow), and the lists that are following you (Following me). 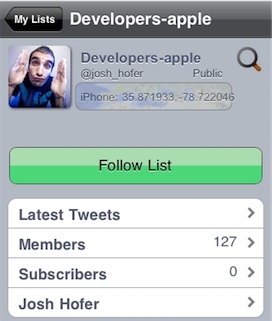 You can see another user's lists by tapping Lists in their User details panel. 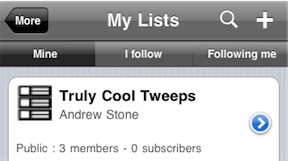 Note: each account will have its own set of lists since lists belong to an account. 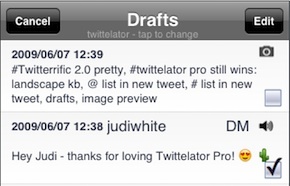 Note: if you had subgroups from an earlier version of Twittelator Pro, you can migrate the to lists when your first launch V3.4 or later. To find tweeters nearby, tap “Nearby”. You’ll learn more about configuring nearby searches below - radius is taken by last value used in Advanced location search. 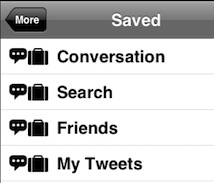 As your searches build up, you can tap “Edit” to delete or reorganize them. 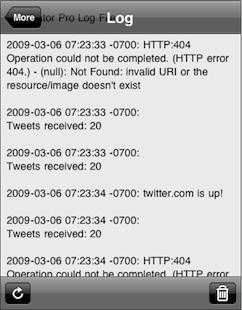 Advanced Search gives you access to the entire search.twitter.com API in a compact form. All means each word in the search query must appear in the found tweets. Exact means tweets must match exactly, None means not in tweet, and Any means all tweets which have any of the words in the search. Did you know that tweets with #hashtags have the PaperClip active - tapping it causes a new search on that #hashtag for you! You can get more precision or generality by tapping the “Location” choice from Dates Location Options and entering the radius of the search. 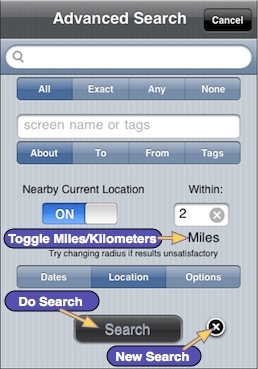 Tap the Miles text to toggle to Kilometers if you prefer. 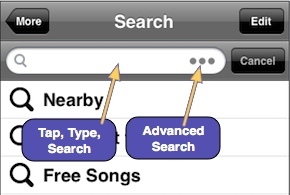 Switching on “Nearby Current Location” adds your current location to the search options. 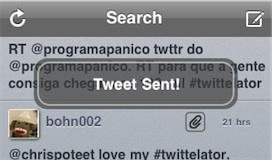 Remember, you get most accurate searches by waiting about a minute after you launch Twittelator Pro! Future “Nearby” searches use these values. Because you can add together options to create very refined searches, you must tap Search button after you are done configuring it. Note the X button to make a fresh empty search. Link returns tweets with links in them, and ??? tweets with one or more questions in them. The bottom category in More is Misc. People ask us all the time, what is that for? Actually, it’s a placeholder for searches, stocks, trends, favorites, and other people’s tweets - that’s where the tweets from those requests end up. 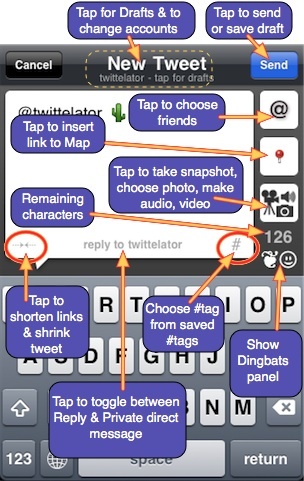 This turns Twittelator Pro into a real time feed machine! 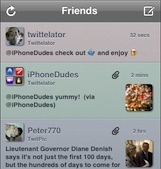 Whenever you launch Twittelator, any item on the Tab Bar is refreshed automatically. Just as in Searches, you can edit the list, reorder it and delete unwanted entries. Follow mentions of Dow Industrial Average. Type in $DIA Read this to make real time feed! 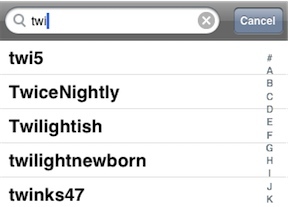 What is hot right now in the Twitterverse? What are people talking about the most? When you tap Trends Twittelator goes out and grabs the topics currently being discussed on the planet. 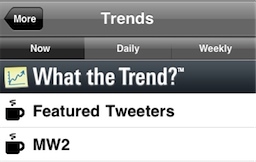 Tapping a trend performs a new search to retrieve the latest tweets on this topic. It’s a great way to meet new people and expand your horizons in ways you have never conceived of before! What the Trend? explains why a topic is trending. Now, you’ll see a little star on that tweet. If you tire of that Favorite, by selecting the name again, you can Unfavorite it! 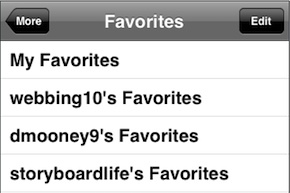 Twittelator Pro automatically adds people to the Favorites category during a session when view a User's details. 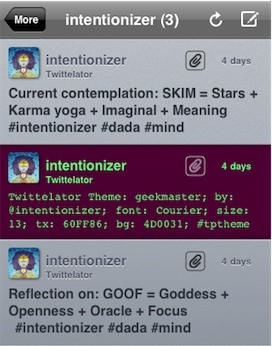 These are added freshly each session with Twittelator - use Bookmarks for persistence between sessions. 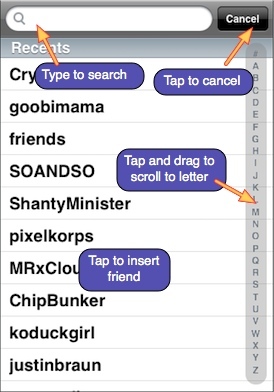 To remove a Bookmark tap the Edit button and you can reorder them as well as delete them. You may want to free up this valuable real estate on the Tab Bar by Customizing Tab Bar with your Lists or a search or who knows? Throw me a lifeline, @twittelator! For faster searces, choose 20 - you can always tap “more” button to get more! 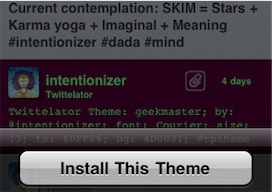 Tap Tweet to share this theme with others - it will create a new compose window with the theme's representation. 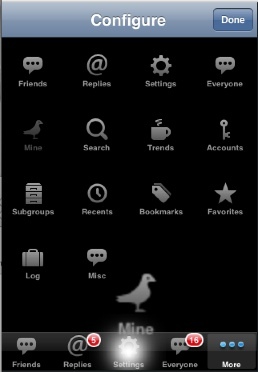 You can quickly revert to the 3 standard themes by tapping gray, dove or raven. Tap Done when you are happy - and don't forget to Tweet your theme to share with others! You are given an option to cancel (revert), or go to Settings to choose another theme. Large Font which makes the tweet font much larger - great for poor viewing conditions! You can Email or Copy the link, you can go anywhere on the Internet with “Open Any Link...” and you can “Go Back” if you have visited other webpages when you tap the Actions button on the top right of the web page. If you have configured Instapaper or Read It Later, you can add this page to your Instapaper/RIL account. Normally, you get a confirmation panel when you hit Send (because sometimes you do it by accident because the keys are close!). If you are a free-wheeling fast-tweeting kind of person, you might want to disable confirmation panel by turning Tweet without confirmation on. You won’t get the handy Save as Draft (tap Cancel for this). Hint for folks with big thumbs: turn the phone sideways to get a super wide keyboard while tweeting. Disable Landscape Mode - for tweeting upside down in bed! Affects Web Browser as well as the New Tweet compose window! 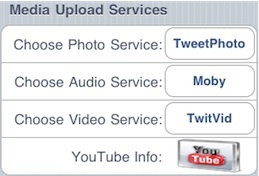 Media Upload Services lets you choose which Photo, Audio and Video sites to use. 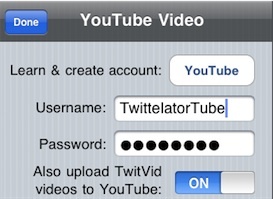 YouTube Info lets you set user/password info so TwitVid, if selected as video service, will co-upload the video to YouTube. Other Services lets you configure your bit.ly account and your WordPress location for uploading photos to your own WordPress site with the TweetPress PlugIn. Image Options lets you choose to upload full resolution photos (warning - this can take a long time on the edge network! Faster on WiFi). 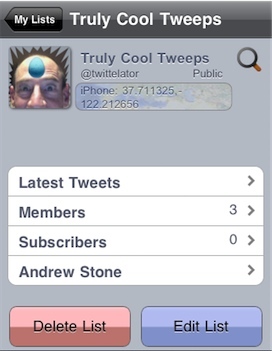 Twittelator Pro caches your friends’ avatars to reduce network usage and increase speed on launch and display. However, if they replace their avatar and use the same old name for the image, then you might see an out of date avatar. Simply tap the Clear Image Cache button to start anew. 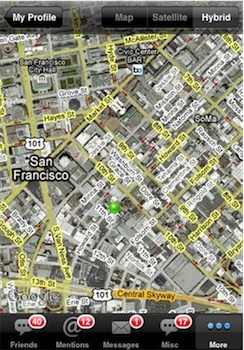 GPS & Location lets iPhone users take advantage of some great features. 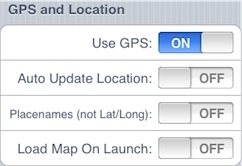 To totally disable GPS, turn off the Use GPS switch. 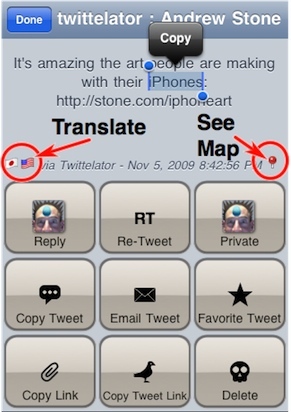 Auto Update Location will set your twitter profile’s location field whenever you launch Twittelator - this is good so nearby tweeters can find you! Heck, the government knows where you are, why not let your friends know too? Placenames attempts to provide the location with the name of your neighborhood, village or city as well as the state. Not always perfect, it’s a bit more readable than raw Lattitude/Longitude which are most accurate. Load Map On Launch might be useful if you are tweeting your location as you move about. As soon as it gets a good GPS location, a new tweet is composed with a link to the Google map of your location, handily shortened via your choice of Link Shortening Service. For fastest launches, turn on Launch Loads Active Only - normally Twittelator loads all the categories on Tab Bar but that can slow launch. Also set number tweets to 20 for fastest launch - you can always tap More to get more! Power users can really use up their limited twitter.com server accesses per hour fast by turning these on! Refresh refreshes Favs makes every refresh - whether by manually tapping Refresh icon or when Auto Refresh is on - update each category on the Tab Bar - that is up to four separate categories of tweets. Use sparingly or face being locked out of twitter.com for the rest of the hour - setting the refresh interval to 5 or 10 will definitely help if you also have Auto Refresh on. Shake to Refresh lets you shake phone to cause refresh! 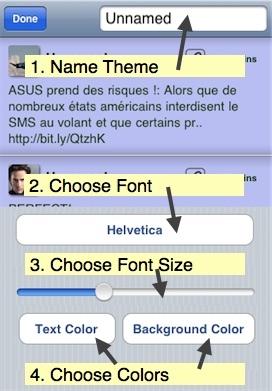 Auto Refresh causes Twittelator Pro to poll the twitter.com server at the interval in minutes that you select above. You can optionally have a sound play if new tweets were downloaded. 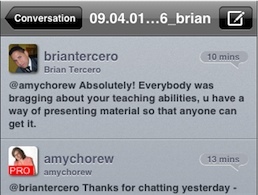 Note, Twittelator may “stall” a bit when new tweets come in - turn this off if you don’t like that! When a tweet goes out, you'll hear the swoosh sound if Play Sound on Send is on, and you'll see a self-dismissing popup for 2 seconds if Show Popup on Send is on. 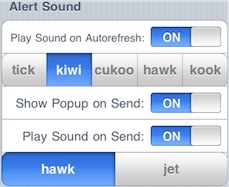 Choose your sound from Hawk or Jet! Note, after entering your info and clicking Done, you may notice a few second delay while your credentials are being validated. 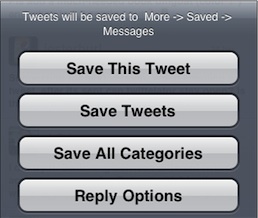 You can save links by tapping name in tweet or actions icon in Web Browser. Note: Twittelator Pro will exit and Safari will launch when you tap this button, because you create the bookmarklet in Safari! 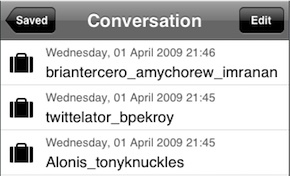 Twittelator Pro keeps track of the network traffic with twitter.com and logs the info to Log. If you are getting error messages, you might refer to the Log to find out more specific information. Tap Trash to empty the log. Tap Refresh to reload it, and tap between them to scroll to the bottom. 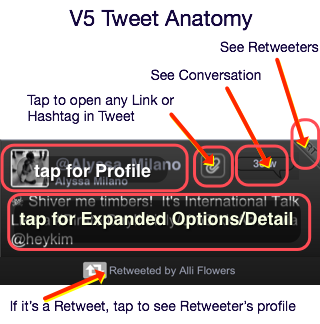 Tap Time to reply to tweeter, tap name to get all the other options - ie, it’s just like normal tweets. What’s New in V2 ? upside down in bed or bath! • You can now "Enable/Disable Notifications"
• go back in time as far as you like! • Archive searches, trends, etc! 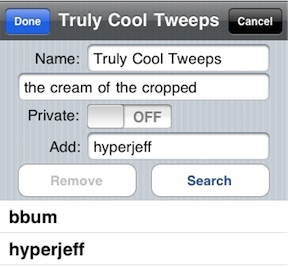 turn on "Just Screen Names"
• Detail shows which twitter app posted last status too! 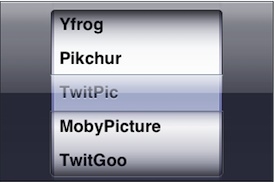 along with moby, twitpic, pikchur, yfrog. La opción 'Grupos' se encuentra ahora dentro de la pestaña 'Más'. Pulsa en el nombre del @usuario para: responder, enviar un privado, copiar o hacer un retweet. Pulsa en la imagen del @usuario para obtener información acerca del mismo. 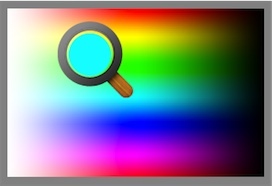 Pulsa en el 'clip' para abrir los enlaces, las imágenes, las #etiquetas y las ¢acciones. Si quieres seguir una conversación, pulsa en la burbuja (bocadillo). Para agregar a un tweeter a la pestaña 'Recientes', mantén pulsado hasta que resalte. Si te interesa marcar como favorito o eliminar un tweet, mantén pulsado durante un segundo hasta que aparezcan las opciones indicadas. Haz una doble pulsación en los tweets inferiores para bajar la página. Pulsa la barra superior para subir la página. Realiza una doble pulsación en la barra superior para hacer que la página se deslice hacia arriba (scroll). Pulsa la pestaña 'Más' y seguidamente 'Editar' para reorganizar la barra de la pantalla principal. Pulsa 'Ayuda' para saber más o accede siempre que quieras desde la pestaña 'Opciones'. Auf "Mehr" und dann auf "Bearbeiten" tippen, um die Haupt-Leiste am unteren Rand zu bearbeiten.